Succession planning means investing in individual and organizational development, but sometimes succession plans derail as talented individuals leave your organization. The natural response is to improve employee retention strategies, right? 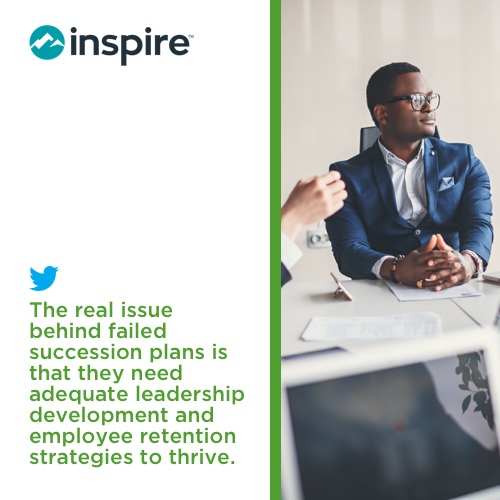 But the real issue behind failed succession plans is that they need adequate leadership development and employee retention strategies to thrive. As opposed to performing replacement planning, succession planning and succession management involve retaining talent so they can become successors. This means investing in talent in ways that will keep them engaged with your company while also preparing them for the future responsibilities. Succession planning and employee retention, at their core, are the essence of leadership development. How should the organization fill key positions? What percentage of key positions should have at least one identified successor? How should employees be prepared for advancement? Establish clear goals – Lay out short-term and long-term performance goals that keep employees who are on the succession track challenged. Focus goals on improving skill-sets, leadership growth, etc. Foster workplace relationships – Encourage team-developing activities and projects. Let the candidates for succession planning migrate between groups of employees to gain exposure and experience in different leadership situations. Add incentives – With regards to retention, add incentives and align them with performance goals to create multiple avenues of motivation. Avoid the “training” mentality – Keep activities fun, engaging and interesting, but still worthwhile. It’s not training because developing leaders means more than just increasing their knowledge and skills. Promote sustainability – The goals don’t end when they’ve been met. Create a continuous program that consistently adds new challenges and new opportunities for growth to push developing leaders to reach new heights with each accomplishment, even if they’re already exceeding the expectations of the succession plan. The next step is to create benchmarks and step-by-step plans to organize the development track, but first you need to identify what skills and/or requirements are needed to funnel talent through your succession plan. Where do you want them to be development-wise in 3 months? 6 months? 1 year? What responsibilities will their new position demand of them? What resources and support do they need to achieve their goals and the succession plan’s goals for them? What challenges might arise during the development process? How can you plan for these challenges? Mapping out the succession plan will give a clear picture of what’s not currently working and where your strategies need to go to be successful. 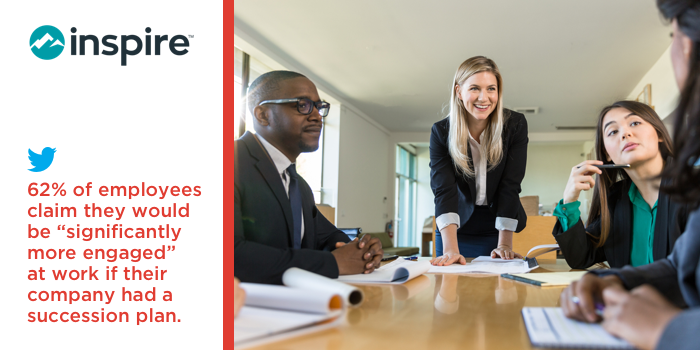 There is nothing new in the fact that engaged employees are more likely to stay at their current employer, but it is important to note, 62% of employees claim they would be “significantly more engaged” at work if their company has a succession plan. In fact, employees who feel their voice is heard at work are 4.6 times more likely to feel empowered to perform their best work. But what do these facts really mean? Team-building exercises and projects – Develop not only individual talent, but group talent to promote engagement, retention, leadership development and succession planning as a company. Themed office days – Incorporating fun activities can increase loyalty, reduce monotony and boost morale. Volunteering opportunities – Give your employees a couple days a month to volunteer for a cause. You can even choose causes that align with your company’s mission or goals to help tie it all together. Time for personal projects – Let employees work on their personal projects for a limited time during the day. Doing so allows them to refresh, prevents burnout and also encourages innovation. Recognition – Give employees recognition for their efforts to help them feel appreciated. It can also be used to build and improve workplace relationships. Incorporating these kinds of activities are aimed at helping employees de-stress, which is great for promoting retention, work-life balance and succession planning in the long-run. All of these strategies keep employee retention at the front of their ideology. Focusing on keeping talent, as opposed to replacing talent, is the surest way to make a successful succession plan. The glues that holds it all together includes leadership development, skill development and employee engagement strategies. How does your leadership development hold up? If it’s time to invest in better strategies to help engage and retain your people, learn how to Inspire Software can help you do so!